Take a good look around and you will probably notice more truck drivers installing grille guards on the fronts of their tractors. Grille guards are one of the hottest items in the trucking industry right now. Why? Because they are functional, affordable, and aesthetically attractive. A well-built guard can mean the difference between preserving the front of your rig and having to pay thousands of dollars to repair it after a collision with an animal. A grille guard also minimizes damage in collisions with other vehicles, and it makes your rig look better at the same time. The number one reason for installing a grille guard is to protect the front of your truck. So grille coverage is really the first priority. You have to ask yourself how much of the front of your rig do you want to protect with the guard. Then consider the actual size of your tractor in relation to the amount of area you need to protect. The largest trucks will not get much coverage with a small guard. The other side of that coin are large grille guards that would be too big for smaller trucks. You can have too much of a good thing, especially if a grille guard is wider than the front of your rig. Stainless steel is the go-to material for manufacturing high quality grille guards. Do not settle for anything less. You want something that is strong and durable, something that will last for as long as you keep driving. Look for a grill guard manufactured with heavy-duty steel; 14-gauge steel should be sufficient for most needs. Also check to make sure the guard is of tubular construction. Geometry dictates that tubes are a lot stronger for this kind of application than rectangular shapes. You ideally want a grille guard that attaches easily without any modification on your part. 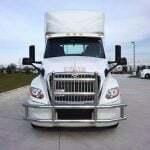 Guaranteeing that is a matter of buying a guard that is compatible with your particular truck. Yes, there are compatibility issues. Each of the grille guards we carry has its own dedicated page on our website. On each page you will find a product description that includes compatibility information. If you cannot locate your truck model and year on the compatibility list of a particular guard, please contact us before purchase. We would rather help you find the right grill guard than have you buy one only to find out it will not work. Finally, we wouldn’t think about explaining what to look for in a grille guard without talking about aesthetic appeal. As a professional truck driver, you take great pride in your rig. We get that. We wouldn’t want you to settle for something that makes your truck look less than appealing. The reality is that a good grill guard can truly enhance the looks of your rig. We trust this is important to you even if you never enter your truck in competition. And if you are a show competitor, it goes without saying that not just any grill guard will do. You want one that fits correctly, provides an appropriate amount of coverage, and looks spectacular when cleaned and polished. Grille guards are all the rage right now. If you are in the market for one, we hope you’ll consider the Mytee Products inventory. And while you’re here, feel free to take a look at all the other cargo control and general trucking products we carry. Your tractor is equipped with 10 of them. Every time you drive, you sit on a platform mounted directly over them, trusting they will get you where you need to go. We are obviously talking about tractor tires. What may seem insignificant to people who do not drive a truck for a living are objects that are incredibly important to you. Good truck tires can be lifesavers. It is with that knowledge that a quick perusal of tire discussions on trucker forums becomes a fascinating endeavor in anthropology. It can be quite entertaining to read comments left by trucker’s arguing over who makes the best and worst tires. One guy will swear by Yokohama while another prefers Goodyear and so on. Still other truck drivers argue over whether to buy cheap tires more often or expensive tires less often. At the end of the day, it all boils down to choosing the tire that gets the job done safely. Unfortunately, though, there is no black and white rule for saying one brand of tire is better than another. Peeling away the manufacturer claims and dealer promotions reveals that tire safety is really all about traction. Isn’t that why you put deep tread tires on your tractor anyway? Of course. You are depending on those treads to channel away water, snow and ice, and debris that could throw off the handling of your truck. You are expecting that tread to give you the traction you need to get going from a full stop on a slick road. 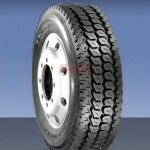 Manufacturers and dealers are fully aware of how important tread is to tire sales. As such, they make a lot of noise about tread depth and pattern. Deeper treads essentially mean longer-lasting tires while specific tread patterns are more advantageous under certain weather conditions. But note that traction and safety do not stop there. There is television programs which feature truck drivers who make their living on the icy roads of Alaska and northern Canada. If you’ve ever watched the show, you may have observed drivers reducing the air pressure in their tractor tires. They do this for a reason. Lower air pressures increase the amount of tire surface that comes in contact with the road. Under icy conditions, this affords extra traction that could be a lifesaver in an emergency. Of course, you wouldn’t want to drive on dry pavement with low tire pressure but running a rig on an icy road is another matter. Another thing that is frequently lost in the discussion over which tires are best is the reality that driving habits matter. How fast a trucker accelerates and brakes partly determines how quickly his tires wear. The same is true for cornering and backing. Tractor tires are under a tremendous amount of stress even when the driver drives perfectly. But how many drivers do that all the time? Very few. How a driver drives also affects the rest of the rig in ways that indirectly affect tire wear. That previously mentioned TV program featured a driver in its first season who was extremely reckless with his equipment. The way this guy ran his rig had him spending more time in the repair shop than on the road. The damage he caused would have undoubtedly affected tire wear had it not been repaired. Tractor tires are indeed lifesavers. When you choose new tires for your truck, consider more than just the brand. There is more to tire safety than a mere name emblazoned on the sidewall. One of the main advantages of canvas tarps is that they are made with natural fibers tightly woven together to create a strong, breathable material suitable for a variety of uses. Truckers sometimes use canvas tarps for certain kinds of loads that demand breathable tarp protection. The question for truck drivers purchasing new canvas tarps is whether to get treated or untreated material. Canvas is an excellent material for truck tarps by itself, but manufacturers do offer tarps that have been treated for water resistance, UV protection, and even fire retardation. So, which is better; treated or untreated canvas? There is no right or wrong answer here. Both materials have their strong and weak points. For the trucker, it is a matter of understanding those points and then determining which choice is better most of the time. Some truckers carry tarps of both types in order to be prepared for anything. Untreated canvas is naturally water resistant thanks to the extremely tight weave of the fibers. But water resistance does not mean waterproof. Treating canvas for water resistance also does not make it waterproof. Rather, the chemical treatment is a wax-like material that causes water to bead up and roll off rather easily. A canvas tarp treated for water resistance is less likely to allow water to pool. On the positive side, a water-resistant treatment also reduces the risk of mold and mildew. As long as a treated tarp is properly dried before being folded and stored away, mold and mildew should never be a problem. On the downside, treated canvas is somewhat less breathable. If breathability is a concern, untreated canvas may be a better option. It would be unusual to find a canvas tarp treated for fire retardation but not water and UV resistance. This dictates that fire retardation involves an extra treatment above and beyond a water-resistant coating. This extra protection is probably not needed except in cases where a canvas tarp may be accidentally exposed to open flame or sparks. The third kind of treatment also applied to canvas tarps is an anti-UV treatment. Because canvas is made of natural fibers, it is subject to break down as a result of UV exposure. Natural UV breakdown can lead to rot if a canvas material is also exposed to mold and mildew. The reality is that all canvas materials break down over time. It is unavoidable for natural materials. But treating canvas for both water and UV resistance slows down the process of wear and tear. A properly treated material is less likely to fall victim to rot. In addition, retreating canvas every few years can extend its life. The truck driver who has chosen treated canvas tarps would do well to apply a new treatment on a regular schedule, according to the manufacturers recommendations. A premium finish coat product specifically designed for canvas is the best option. Finishing products can be found at boating and RV centers, trucking supply centers, and even sporting goods outlets that carry canvas tarps and tents. Our selection of canvas tarps is limited to just two. Furthermore, both products have been treated for water resistance. Our canvas tarps are very good general-purpose tarps that you could use for a variety of purposes. Canvas is an excellent choice for fruit and vegetable loads, exterior building products, highly sensitive machinery, and virtually any other kind of cargo that requires breathable tarp. To treat or not to treat? That’s entirely up to you. Either way, canvas is great tarp material.